The NASA/ESA Hubble Space Telescope a new space wallpaper image of the Antennae Galaxies. 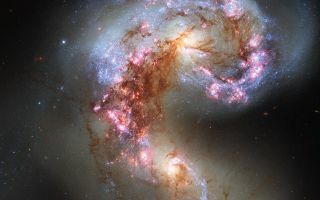 The NASA/ESA Hubble Space Telescope a new space wallpaper image of the Antennae Galaxies.The galaxies — also known as NGC 4038 and NGC 4039 — are locked in a deadly embrace. Once normal, sedate spiral galaxies like the Milky Way, the pair have spent the past few hundred million years sparring with one another. This clash is so violent that stars have been ripped from their host galaxies to form a streaming arc between the two.